In Episode 32 we get real about incentivizing people. If you think incentive trips are a "boondoggle," you are wrong. Dead wrong! It's incredible what the research shows incentives do for both the bottom line of your business AND the CULTURE. It isn't just about the sales team either if that's what you're thinking... this is a marketing tool that works both internally and externally for businesses that we should all know more about. Christy is a professional speaker, writer, coach and proud owner of Strategic Meetings & Events. Her team produces goal-driven, event investments that support sales cycles, and bring marketing messages to life. They turn events into revenue boosters for elite sales and marketing professionals. Christy is the author of "The Strategic Planning Guide for Event Professionals," published in November. Lisa is an expert corporate event designer, connector, and sourcing resource. Her original inspiration and spark came from personally achieving her first President’s Club group travel award in the direct sales industry with Creative Memories, Inc. She realized the impact of inspiring and motivating people through rewarding motivational experiences – a different approach to improving lives from her field of study, which was cancer research. On this episode we learn the true value of the role marketing has in incentivizing performance across the company. If your company no longer has an incentive program, for sure you'll want to re-visit that after listening to this episode because it will pay dividends. We are "Making a Marketer"... in all ways. Check Ep.32 out -- and we would love for you to subscribe, rate, & review us on iTunes -- https://bit.ly/mamITuneNEW. Get each ep. when it drops! In Episode 31 we are live on Facebook, speaking to someone who has made crisis communication a key area he is speaking and teaching on. It's marketing's responsibility to share out information if a crisis occurs. Period. With the emergence of social media, that is now a key place to share it… And you MUST have a plan in order to do it properly! Alex Plaxen – President/Founder Little Bird Told Media. Alex is passionate about using social media to amplify the reach of events. Little Bird Told Media's tagline is "Where Online Meets Offline." Alex Plaxen has a Crisis Communication Certification he's teaching for Meeting Professionals International, so he was the perfect guest to have to speak on this topic. Check out this quick show, and then go back to your organization and make it a priority. We are "Making a Marketer"... in all ways. Check Ep.31 out -- and we would love for you to subscribe, rate, & review us on iTunes -- https://bit.ly/mamITuneNEW. Get each ep. when it drops! In episode 30 we dive into... how do you make sure your event marketing spend produces real results? Creating an experience takes more than blinky lights. Your attendees need to feel something and achieve their goals (or your goals) for the event. We define experiential events and explore topics such as mindfulness, engaging all five senses, empathy for attendees, and making sponsorships more valuable to the sponsors and participants. There are lots of ways to transform your events, and we explore them all on this show. Our guests are talented event designers and we’re excited to share their knowledge with you. For more on mindfulness and events, listen to this podcast where our co-host, Elizabeth Glau, was a guest. Enjoy learning from these experts as much as we did, as we deep-dive into the important topic of transforming events. We are “Making a Marketer”... in all ways. Check Ep.30 out -- and if you’re so inclined, we would love for you to subscribe, rate, & review us on iTunes -- https://bit.ly/mamITuneNEW. Get each ep. when it drops! The term "Influencer Marketing" has been very hot, especially in light of the Fyre Festival documentaries bringing it to the forefront! The thing is, as our guests on episode 29 share with us, there should be a distinction between an influencer and an endorser. Have you heard the term "Key Opinion Leader"? We cover that too. There are all sorts of levels of influence, and we explore them all on this show. Our three guests are inspirational women working within the meetings and events industry. She’s a strategic thinker, creative idea generator and an event industry speaker. She provides strategic input and guidance and creates, develops and delivers integrated marketing campaigns for non-profit and corporate organizations locally, nationally, and abroad. Tamar has 15 years of event experience from individual project to portfolio management, which includes overall financial responsibility and management of sales, marketing, operations and finance. Also managed a number of launches and acquisitions (including due diligence and integration). Mariska is the engine behind the 'Word of MICE' who finds the right social influencer for your region, city, convention bureau, hotel or venue. Let us help you tell your story, and build a unique global campaign to promote your service/product. Want to know how much your Instagram posts are "worth"? Rachel shared this Website with us: Influencer Marketing Hub. If you're interested in learning about some very obscure travel destinations, Mariska shared this with us: Atlas Obscura. Sit back and relax, as we deep-dive into the important topic of influencer marketing. Facebook advertising is necessary, and our guest on episode 27 is an industry expert on the topic. He’s an “in demand” speaker at the top social media marketing conferences, and it’s because he knows his stuff. Through his years of experience in online marketing Azriel Ratz has perfected his strategy for companies to find their ideal audiences and create the most relevant ads for their businesses. More than anything, what’s clear on this episode is that it's crucial to test, test, test… optimize.... tweak… and test some more! It's Azriel's feeling that the ability to advertise on Facebook is easier than it used to be, and he gives us some great knowledge bombs our hosts were furiously notetaking on! Whether you’re a pro or just getting started with FB ads, this is the show for you. We are “Making a Marketer”... in all ways. Check Ep. 27 out -- and if you’re so inclined, we would love for you to subscribe, rate, & review us on iTunes -- https://bit.ly/mamITuneNEW. Get each ep. when it drops! LinkedIn has NOT lost relevance, and this young professional has proven this over the past three years. Michaela Alexis is a powerhouse millennial speaker and LinkedIn expert with us on episode 25. She grew her following on the platform from just 200 to 125K over the course of three short years. Michaela is a millennial LinkedIn Master, keynote speaker, trainer, author, and coach trying to shake up the business world. She’s presented Keynote Talks and Panel Discussions on the following topics: The Power of Personal Branding, Building a Mega Audience on LinkedIn, Optimizing your LinkedIn Profile, and more. 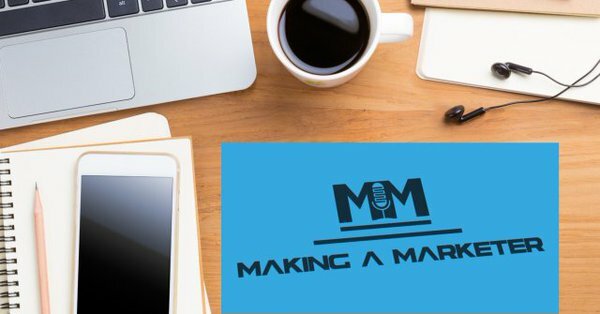 She provides training workshops, influencer marketing, and LINKEDIN CONSULTING -- our topic of this show. In listening to this show you’ll see WHY people want to know what she has to say about LinkedIn and branding in general. So many knowledge bombs are dropped on this one! Learn that you should “share your why”... Focus on connections and not simply impressing people… LinkedIn is your “Career Insurance,” and it’s likely you’ll think about it all differently after listening to this show. We are “Making a Marketer”... in all ways. Check Ep. 25 out -- and if you’re so inclined, we would love for you to subscribe, rate, & review us on iTunes -- https://bit.ly/mamITuneNEW.